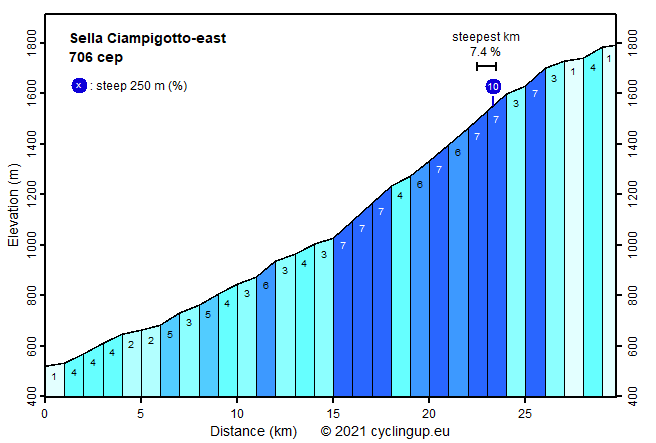 The ride from Ovaro through the Val Pesarina to the Sella Ciampigotto is long (30 kilometers) and as far as the slope is concerned little spectacular. The steepest part (often 7%) starts after 15 kilometers with two hairpin bends and ends eight kilometers further on, just after the turnoff to the Forcella Lavardêt. Just around the turnoff the steepest kilometer (7.5%) and the steepest stripe of 250 meters (10%) of the ride are found. Although really steep sections are missing, the climb is rewarding because, especially after the last village (Pesarîs), there is little traffic and because the tour is varied. Until Pesarîs the road passes through a series of villages. After that forests dominate. Only after the Sella di Razzo (1740 m), three kilometers before the end, the surrounding mountain peaks get clearly visible. For those, who consider continuing towards the Forcella Lavardêt and to Campolongo at the fork after 23 kilometers: this part of the SS465 is closed to traffic and has (in 2017) a catastrophic road surface.